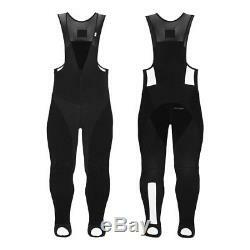 Technical cycling tights for very cold conditions. These high-performance cycling bib tights have been created to provide maximum protection in harsh conditions without compromising the riders range of movement. Designed to be worn over padded cycling shorts, the legs of the tights feature pre-bent knees for a superior fit, and which will also aid pedal strokes. The body of the tights are made from a heavier weight, fleece-lined fabric which is highly breathable and reinforced in key areas. The front of the legs have windproof panels and there is a harder wearing fabric at the seat, which is abrasion-resistant, water-repellent and includes reinforced stitching. The chest and rear leg panels use a thinner fabric that works with your base layer and jersey to prevent overheating. Offset seams are positioned to prevent chafing and the bibs are made from a strong, breathable black mesh. Other styling includes white panels on the lower back and a reflective white stripe down the back of the left leg. The stirrups of the tights provide extra support, use a durable binding and can be folded inside if not required. The left-hand shoulder features a pink tab with Rapha logo and the top of the seat panel has a printed WHEELSUCKER motto to encourage your training partners (or provoke your enemies). NB: The Deep Winter Tights sizing is race-tight. Please select your regular size or, if you want a more relaxed fit, move up one size. Pre-bent knee for superior fit. No padded seat insert means they can be worn over your favourite bib shorts. 45% nylon, 42% polyester, 13% Elastane. 52% nylon, 32% polyester, 16% Elastane. The item "Rapha Men's Cycling Deep Winter Tights Medium M Black RCC Thermal NEW" is in sale since Wednesday, December 5, 2018. This item is in the category "Sporting Goods\Cycling\Cycling Clothing\Shorts".r" and is located in New York, New York.